Community Baptist Church's First Lady, Sister Earlene Jenson Roberson, came to our church with her husband Reverend Sam Roberson, the pastor of our church. They have been our church leaders and spiritual encouragers. Sister Roberson believes God joined them together and when God joins two people together no one can separate them. They are a devoted couple and proud of two daughters, three sons and ten grandchildren. Sister Roberson realizes it has not been an easy job being a pastor's wife, but Jesus didn't say it was going to be easy. He said, "The race is not given to the swift, nor the strong, but to those that endure and hold out to the end." She has learned to depend on Jesus and put her trust in God. She believes prayer is the key and faith unlocks the door. John 16:24 says, Ask and ye shall receive that your joy may be full. " God is an inexhaustible reservoir of life's blessings. He waits eagerly to bestow them upon us. These blessings will be given freely if we pray in faith. When prayer becomes the attitude of the soul then glory comes in and the wonderful possibilities of life begins to open as they never opened before. Our Pastor's wife has a sweet personality, and her steadfastness has won many friends for her. She is a most efficient pastor's wife who works in the church and holds a full-time job at Humana Sunrise Hospital. She is a graduate of the COMBACH school of Evangelism. She also teaches the junior Sunday School class, a teacher in our Vacation Bible School. She believes in good discipline and teaches all children self-control and instills in them love for others and that the love of God will guide them into the better way of life, the Christian life. To her, the abundant life is the Christian life. That life in which we follow Jesus as our Savior and Master; then it is a good life, a happy life, a wonderful life. We need power to live this abundant life; we need strength for daily Christian living. Jesus has shown us we can get power to live bravely and follow him faithfully. It is the way of prayer. Jesus received his power from His Heavenly Father through prayer. 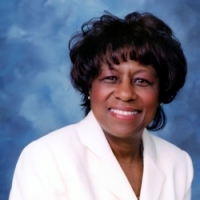 On behalf of Sister Earlene Roberson, she wishes to thank all members and friends of the Community Baptist Church Family and those of the Las Vegas Community for supporting her and Pastor Roberson. She gives thanks to her mother, Jerene Jenson, and her children. When Sister Roberson's burdens get a little heavy, she remembers Philippians 4:13, "I have the strength to face all conditions by the power that Christ gives me." She always says, Many things about tomorrow I just don't understand, but I know who holds tomorrow. I know who holds my hand. I just live one day at a time." We ask God's blessings on one of his devoted and praying women, OUR FIRST LADY, OUR LEADING LADY Sister Earlene Jenson Roberson. face all conditions by the power that Christ gives me." She always says, Many things about tomorrow I just don't understand, but I know who holds tomorrow. I know who holds my hand. I just live one day at a time."